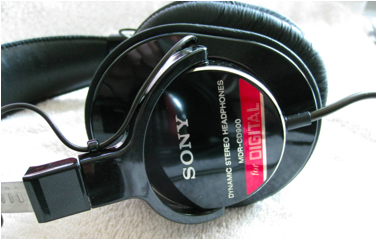 As the thirtieth anniversary of the Sony MDR-CD900 and MDR-V6 headphones is upon us, I thought I'd take an opportunity to pay a little homage to the ubiquitous headphones. But before I begin: Sony, Walkman, etc., are all trademarks of Sony Corporation. Sony had nothing to do with this site; all of the photos except for one are mine from my own collection; the text is mine culled from various sources, including other websites, catalogues, and service manuals, so the text and history is Copyright (C) 2016, Kai Harada. 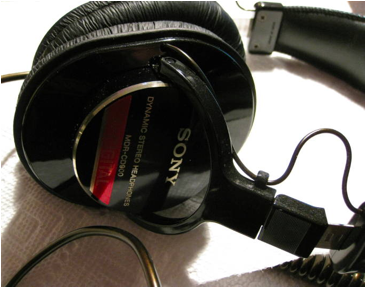 In the early 1980s, with the advent of the Walkman, Sony pioneered lightweight headphones, allowing users to take quality sound reproduction with them. 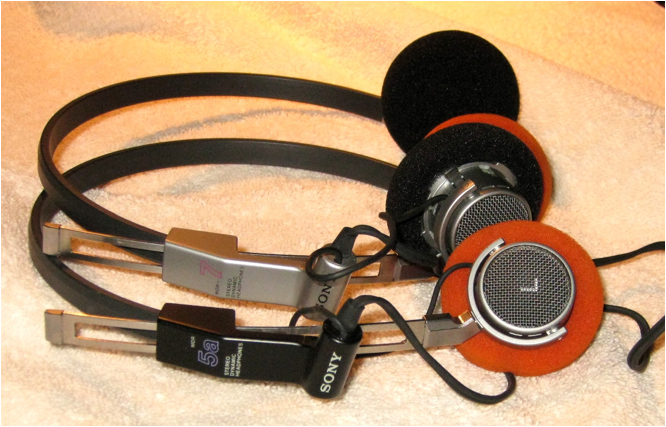 Most of these headphones (MDR-1, MDR-2, MDR-3, MDR-4, and MDR-5) featured 23mm dome drivers, but higher-end models, such as the MDR-7, used 28mm drivers. 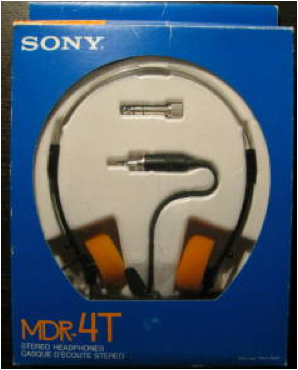 The MDR-4L1S, included with the WM-2 Walkman, became somewhat of a status symbol with their orange earpads. UNIMATCH PLUG, AND NO MUTE SWITCH. 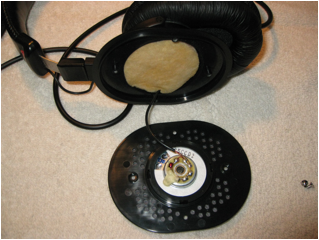 ORIGINAL EARPADS WERE BLACK. 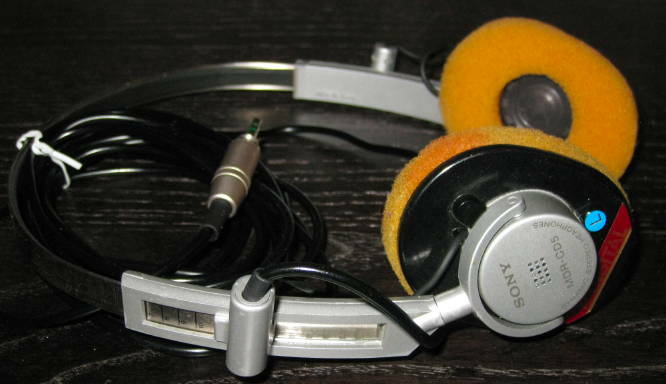 MDR-4L1S HEADPHONES, WHICH CAME WITH THE WM-2. I started taking phentermine due to being overweight. I lost 20 pounds a month 1. This medicine works better and more efficiently than any other medicine I know the purpose of weight loss. I want to continue and lose at least weight in order to this site be in healthy weight. This is the best diet Supplement. Audio professionals, however, opted for the circumaural (on the ear) DR-series headphones, especially in ENG (Electronic News Gathering) applications. Originally introduced in the 1970s, the early DR generation sported cone (paper) drivers, but as fidelity became increasingly more important, Sony experimented with other materials, resulting in a dome driver that carried into their lightweight models in the 1980s. The DR-6M, DR-M7, and DR-Z6 models became especially popular because of their ability to be folded for easy carrying. Many Japanese reporters used these models along with early Sony cassette tape recorders, called "Densuke" in Japan, based on a cartoon-character report of the same name and generation. In 1983, Sony and Phillips introduced the Compact Disc, and with it came a slew of digital recording equipment. Sony engineers realized the need for a higher-quality headphone suitable to reproduce the ful frequency range of the new format. Coinciding with the Compact Disc, Sony released the MDR-CD5 and MDR-CD7 models, both utilizing a 30mm dome driver, specifically designed for digital audio applications. 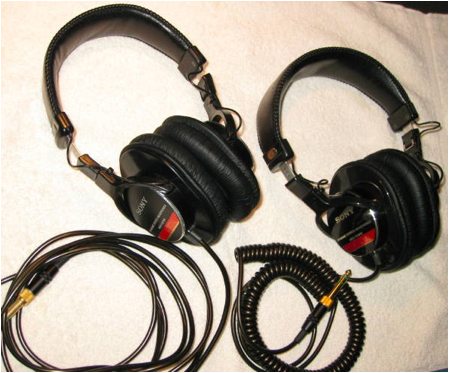 The two models were similar, but the CD7 boasted a gold diaphragm and was a sleek black color, while the CD5 was silver colored and had a standard PET diaphragm. They were extremely lightweight and provided some limited isolation from outside noise with an oval on-the-ear earpad design. 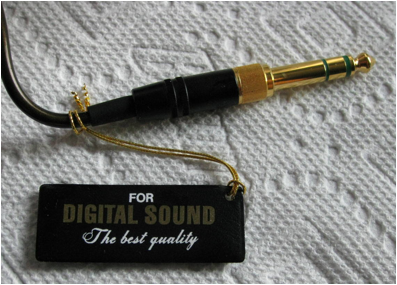 The connecting cord terminated at the left ear only, and made them very popular in professional audio applications. ORIGINALLY THEY WERE BLACK WITH A URETHANE COVER. 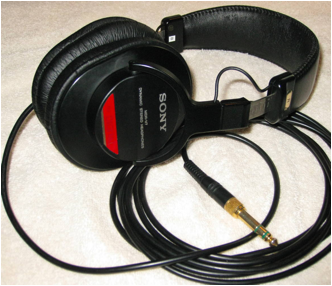 Finally, in late 1985, Sony released the MDR-CD900 in Japan, and the MDR-V6 in the rest of the world, finally bridging the gap between high quality audio and a closed-ear design. 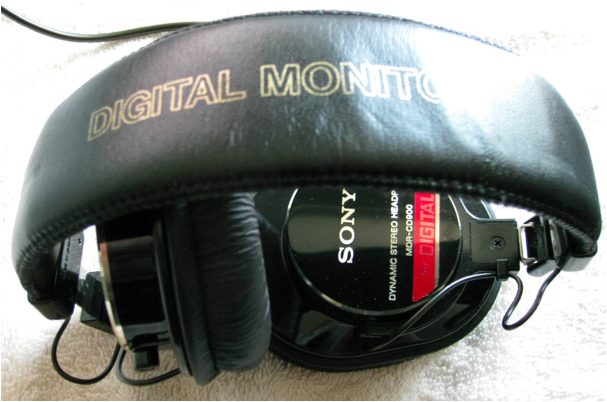 These were flagship "DIGITAL MONITOR" headphones with full 20Hz-20kHz (some specifications state 5Hz-30kHz), a closed ("supra-aural") over-the-ear oval design, and could be folded up for portability. They boasted a CCAW voice coil, samarium cobalt magnets, a single-sided coiled cord, and a 40mm diaphragm. 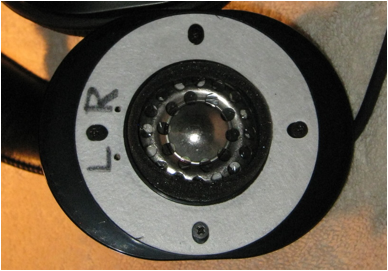 The Japan-only MDR-CD900 featured an Amorphous Diamond diaphragm, whereas the Export-Only MDR-V6 had a standard PET diaphragm. 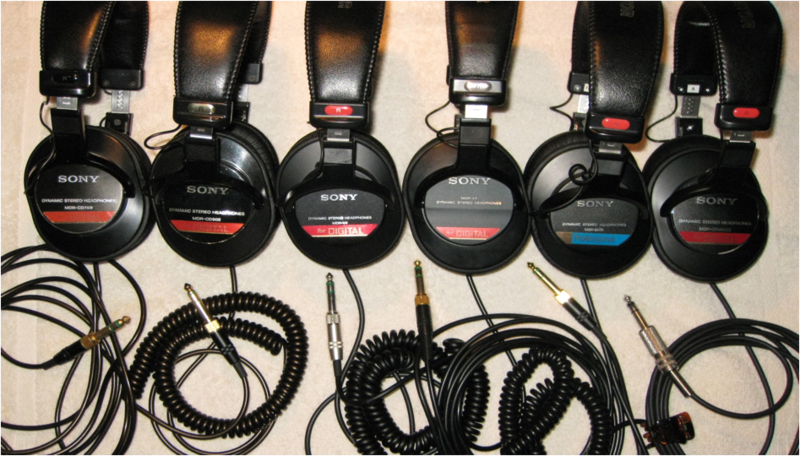 All headphones of this series were rated at 63ohm impedance at 1kHz. 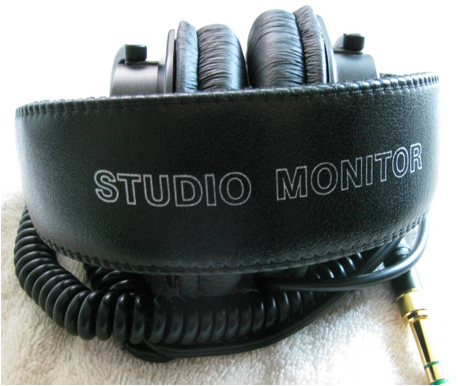 MDR-V6, FOLDED; NOTE "STUDIO MONITOR" AND MATTE SURFACES. 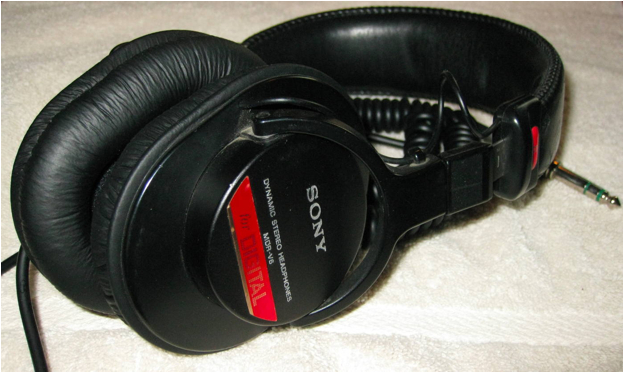 In 1986, the other members of the family appeared: the MDR-CD700 (Japan) and MDR-V7 (rest of the world) seemed to be designed for at-home "hi-fi" listening, with a non-foldable design and a long, straight cord. The CD700 utilized a 40mm Gold diaphragm, while the V7 used a 40mm titanium diaphragm. 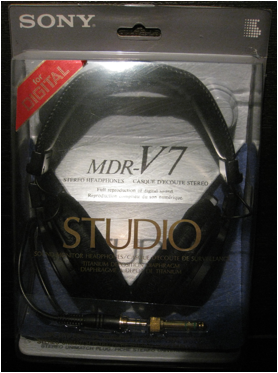 (Some sources say that the MDR-V7 had a 50mm diaphragm but this is incorrect). 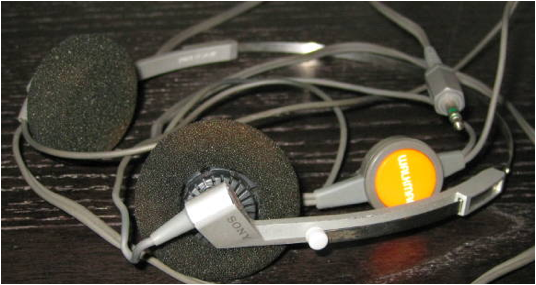 Non-foldable designs had a shorter headband compared to the foldable versions. (30mm-driver "on-the-ear" versions also appeared, namely the MDR-V5, V4, V3, V2, V1, V606, V404, CD500, CD300, and CD100; someday I may write something about those). 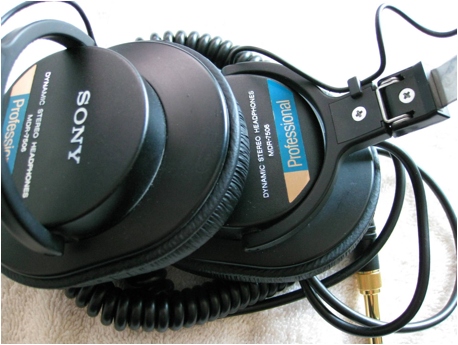 Although the MDR-V6 was designed for consumer applications, professional sound engineers quickly discovered their utility, and in 1991, Sony released the MDR-7506, which was essentially an MDR-V6 with a gold-plated plug and neodymium magnets in their drivers; they were distributed through Sony's Professional Equipment division and thus came with a better warranty. A Service Manual, listing all repair parts, was also included for easy in-the-field repair. (Contrary to some reports, the wiring for the MDR-V6 and MDR-7506 is EXACTLY THE SAME as all the other Sony headphones in this family). 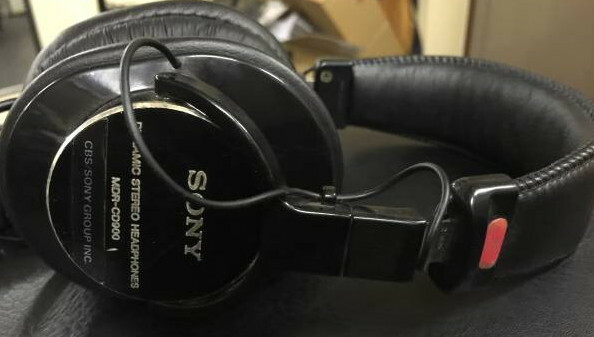 Back in Japan, Sony worked with its recording studios-- CBS/Sony Shinanomachi Studios-- later Sony Music Studios-- to produce a headphone specifically designed for professional use. 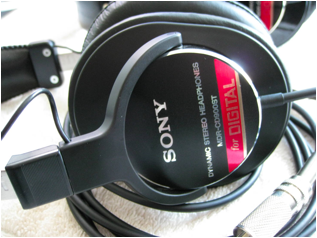 Using MDR-CD700 and MDR-CD900 consumer headphones as a base model, sound engineers gave notes to Sony engineers to devise a particular model voiced for studio monitoring applications. 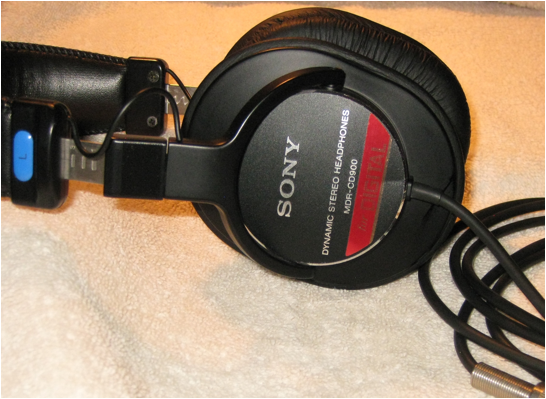 MDR-CD900/CBS, WITH CBS/SONY LABEL (PHOTO FROM A YAHOO! JAPAN AUCTION PAGE; THESE SOLD FOR ABOUT $400 IN 2015). 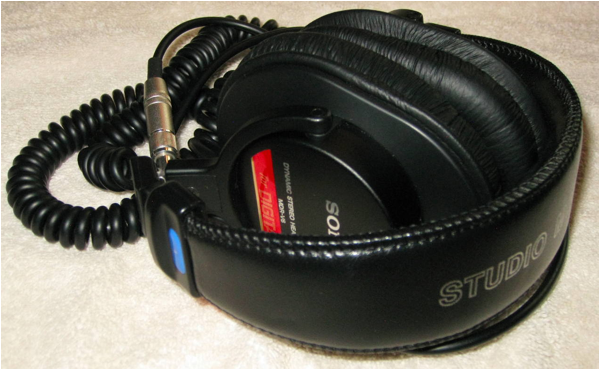 A second series of professional studio-only headphones with design concepts from the CD700 and V7 appeared in late 1989; these were only available through "official" channels. 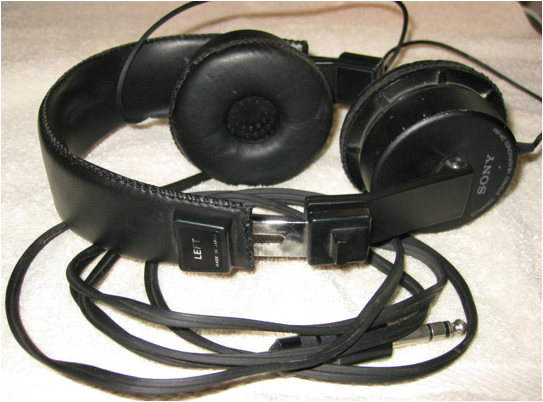 These headphones, also labelled MDR-CD900, were no longer foldable, had a matte finish, and integrated the left-to-right cable pass into the ear hangers. 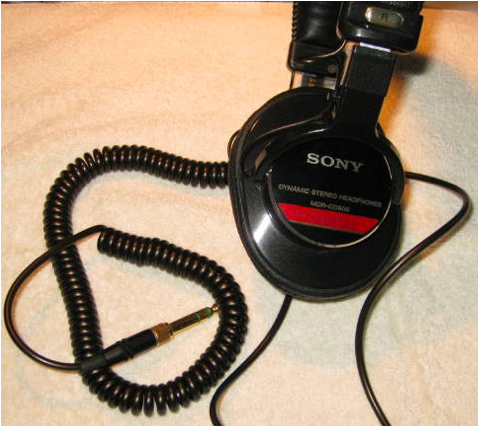 The cable was no longer coiled, and terminated in a 1/4" plug; no Unimatch 1/8" connector with 1/4" adaptor like the original CD900, V6, or 7506. 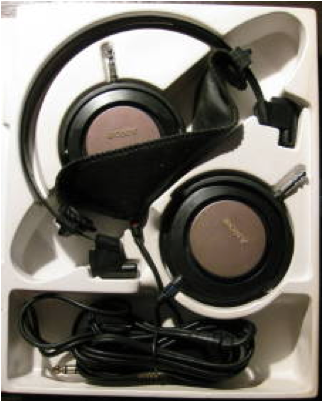 After 1995, the housings were changed to officially name the headphones MDR-CD900ST (STudio, of course), and were available to the public in Japan, packaged in a plain white box (now cardboard colored), with no manual and no warranty. Like the MDR-7506 internationally, the MDR-CD900ST headphones are designed to be easily reparable, and spare parts abound for the professional in Japan. Some special limited-edition variants for promotional use have also been released, as listed below. (ONLY MODEL WITH THIS ABSORPTION). Many, many parts from the different series of this generation are interchangeable, leading to a lot of customization possibilities, which I may discuss at some other point. 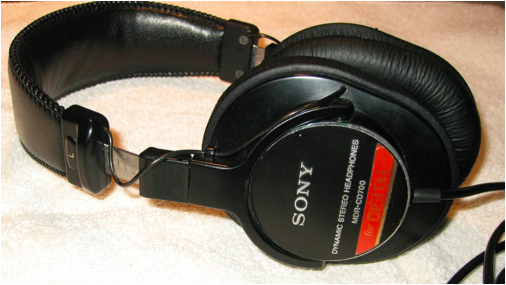 After the original V-series was introduced worldwide, Sony introduced several generational improvements over the years, but only the V6/7506/CD900ST have remained in steady production for thirty years. 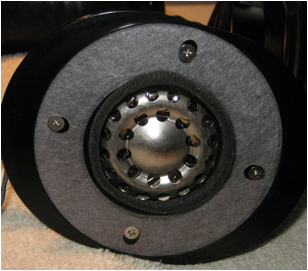 -CD555/666 utilized 30mm drivers with a titanium diaphragm in a newer form factor. 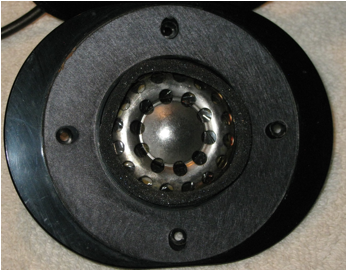 -CD777/888 utilized 40mm drivers with a sapphire-evaporated diaphragm in this same newer form factor. 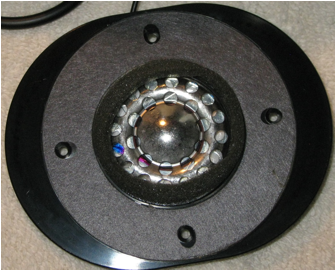 -CD999 utilized 50mm drivers with a amorphous diamond diaphragm. -CD250, 350, and 450 utilized 30mm drivers, and differed only in form factor. -CD550 and 750 utilized 40mm drivers. -CD850, 950, and 1000 utilized 50mm drivers; CD950 used amorphous diamond diaphragms, and CD1000 used biocellulose diaphragms. 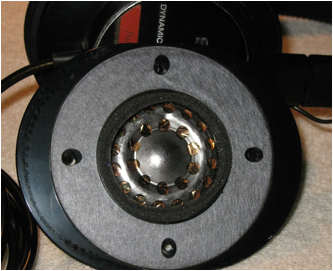 -CD3000 was a flagship model utilizing 50mm drivers with biocellulose diaphragms and a non-resonant housing. -MDR-R10 was THE king of headphones, utilizing 50mm drivers with biocellulose diaphragms, housing from Zelkova wood, and lambskin pads. Only 3000 were made! -V600 or Z600 were designed to be direct successors to the V6, addressing some users' complaints that the V6 sound signature was "too bright." A lower-impedance 40mm driver was used. -V900 or Z900 were 50mm versions, and evolved into the V900HD and Z900HD versions with extended high frequency range. -CD270, 370, and 470 utilized 40mm drivers in a new form factor that was designed to reduce mechanical noise when the headphones were moved (which was an issue with the third generation). -CD570 and CD770 utilized 50mm drivers in this same new form factor. -CD1700 utilized 50mm drivers with Vectran biocellulose diaphragms. -CD280 utilized 30mm drivers in a newer form factor with softer, bigger earpads. -CD380, 480, and 580 utilized 40mm drivers in this same new form factor; 480 and 580 had a detachable cord. 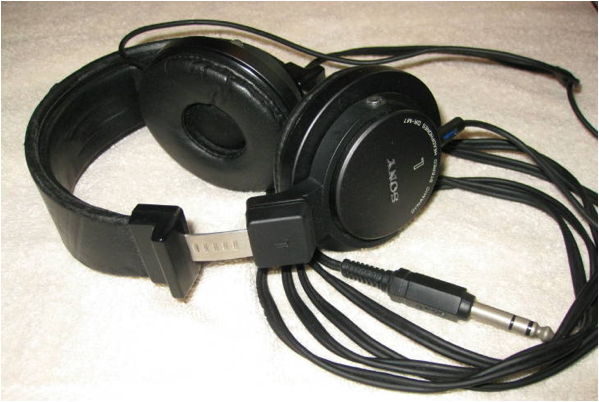 -CD780 utilized 50mm drivers, also with detachable cord. -CD2000 utilized 50mm drivers with Vectran biocellulose diaphragms, also with detachable cord. -V500DJ or Z500DJ used 40mm drivers and had fully swivelling earcups, making them popular with DJs. 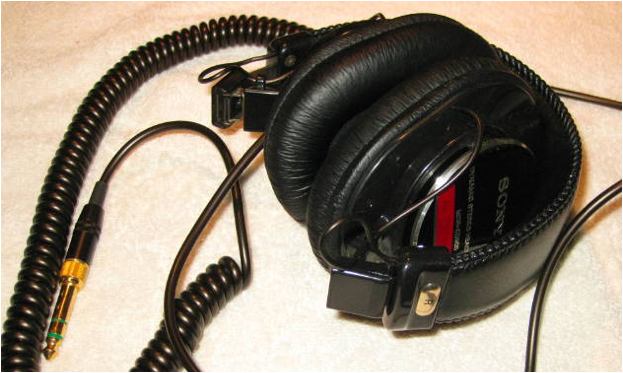 -V700DJ or Z700DJ used 50mm drivers and had fully swivelling earcups, making them popular with DJs. Fake MDR-7506s from China, and how to identify them. Modifications to any of the series.